We’d been hearing off-and-on about Apple’s iOS in the Car since it was detailed at last year’s WWDC. Today, the Cupertino officially unveiled it under the less wordy, more Apple CarPlay branding, and now, manufacturer Volvo has chimed in with a new video showcasing how the system looks and functions in practice. Check it out after the break! A bunch of auto manufacturers have been priming and prepping their next fleets of cars for seamless compatibility with CarPlay, with Volvo being among them. A short while ago, the company’s YouTube account was updated with a new clip showing CarPlay in action, and with promises of Wi-Fi support in the not-so-distant, the system is shaping up rather nicely. CarPlay will support a whole bunch of mobile devices from the get-go, and with Volvo also integrating its own set of steering wheel-based controls, those in ownership of the XC90 SCUV, and subsequent models thereafter, will be able to enjoy a very immersive in-car iOS experience. As Volvo has announced, the XC90 SCUV will be first in line to enjoy CarPlay, but as well as taking care of its own interests, Volvo has also divulged a few key details that we didn’t get from Apple’s earlier announcement. 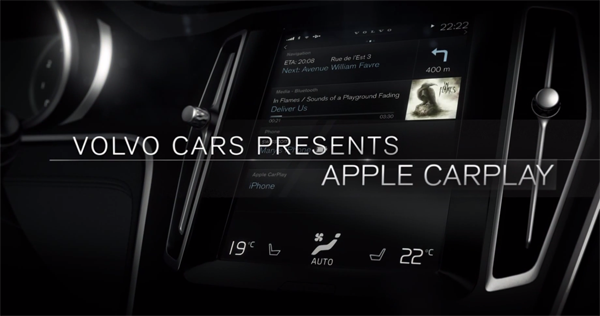 One key feature to note is the H.264 video streaming through which the connection operates, and with the CarPlay naming derivative of the company’s very own AirPlay streaming service through devices, it would appear as though the in-car infrastructure is not too dissimilar to what is already available. 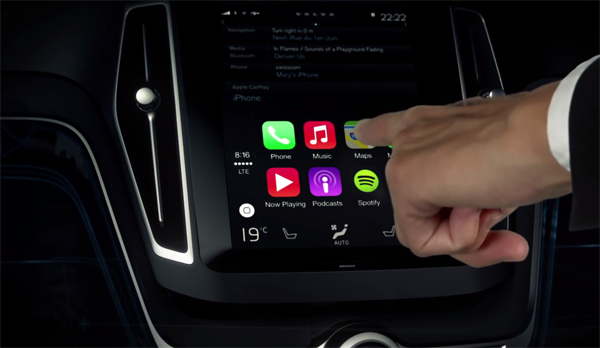 One thing Apple users are accustomed to with AirPlay is seamless functionality and smooth integration, and while we’ll have to wait and see whether CarPlay can hit the same kind of mark, the omens are certainly positive as per this Volvo demo. Natively, CarPlay requires a Lightning-enabled device in order to connect, but with Volvo promising that Wi-Fi support will be forthcoming, this could perhaps pave the way for non-Lightning devices to grab a piece of the action. Apple has stipulated that iPhone 5 will be the oldest device drafted in for CarPlay support, but with these kinds of restrictions often worked around, there’s more than a small chance that the new in-car system’s reach will stretch beyond the latest and greatest. Check out the video below, and be sure to leave your comments via the usual channels.